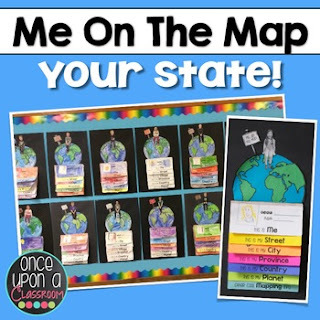 This is a master list of all the currently available "Me on the Map" state specific packs. I take requests!!! Need a different state or province? Different country? Email me at erinneb@yahoo.ca and I would be more than happy to make one for you! Elevate your Local Community or Global Community units with this interactive flip book activity! Not only will students gain an understanding of their place in the world but you will have the BEST bulletin board display in the entire school showcasing their amazing learning! Parents LOVE seeing these at Open House! 2. Two options for printing - #1. White Pages Flip Book - if you want your students to color the pages (all elements print on white paper) or #2. Colored Pages Flip Book (titles and other text print on vivid paper but students colour, cut and glue elements to piece each page together). Unlike other Me on the Map activities you may have seen, mine is the only version that is state-specific. This means your students will learn about information that is personally relevant to them and where they live. This is very important when you are trying to teach students how they fit into the world, especially when they are first learning about local and global communities. I was SUPER DUPER ice cream scooper excited to come across this resource!!! Everything about it looks amazing!! The kidlettes are bound to be engaged when we start our "Mapping" unit when we return from Christmas Break! I can hardly wait to start making this with them. Please follow the link below for your state/province to purchase. This page is for informational purposes only.